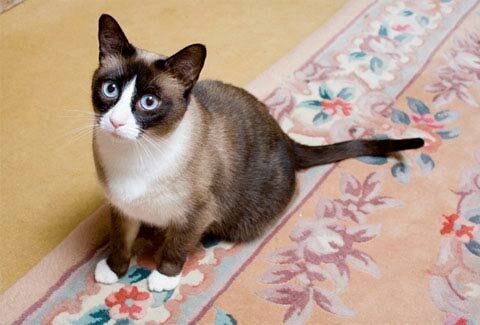 Snowshoe cat breed information and advice. Snowshoes are as different as pebbles on the beach - each kitten has his own distinctive pattern. With their stunning deep blue eyes and signature white feet, it’s hard not to fall for the striking Snowshoe. A relatively rare breed, these beauties aren’t just a pretty face. Anne now has three Snowshoes at home, all of which are female: “The eldest is Coldenufforsnow Osage, who we call Saffy, a seal mitted kitty who is nine years old and was my first Snowshoe. She is most definitely a one-woman cat — and that woman is me! “She loves chatting away to me and is the proud mother of my other two Snowshoes, Ruby and Amethyst. Despite Snowshoes being so rare, world-famous feline, Grumpy Cat, is believed to have possible Snowshoe traces in her ancestry! Snowshoes are a lively breed and love to play. They can be quite mischievous too. With a medium build inherited from the mix of their sleek Siamese and stocky American Shorthair ancestors, Snowshoes are characterised by their trademark white feet and bright blue, walnut-shaped eyes. They have a wedge-shaped head with slightly rounded contours, medium to medium-large ears, and a medium tail which tapers slightly towards the tip. Snowshoes have muscular yet agile bodies and a short, close-lying coat, which can appear to have a slight sheen when in top condition. The most common colours are blue- and seal-point, although there are others. In terms of patterns, the classic seal with the inverted V-shape mask is most commonly seen, but there are also mitted, colour-pointed, bi-colour and harlequin patterns. The breed was first discovered in America in the early 1960s when breeder Dorothy Hinds Daugherty, from Philadelphia, discovered that three kittens in a litter of Siamese each had four white feet. She developed the breed by crossing one of the kittens with an American Shorthair and named the breed Snowshoe because of their signature white paws. The Snowshoe was brought across to the UK thanks to Mollie Southall, who promoted the breed after spotting one in a pub when on holiday in Norfolk back in the 1990s. Snowshoes were given championship status by the GCCF in 2013. Snowshoes are a healthy breed and have no known inherited diseases. Although cases of polycystic kidney disease (PKD) have been reported, no mandatory tests are required from breeders. Snowshoes are fairly low maintenance when it comes to grooming, with very little upkeep needed thanks to their short coats. They are very clean cats who are happy to groom themselves, although a brush every now and again can help with moulting. Is the Snowshoe the cat breed for you? Snowshoes are suitable for most households, but due to their extroverted nature, they would be better suited to homes where they won’t be left alone for too long, or where they can live with other animals. They get on well with children and other pets and do not need to be indoor-only (although if you live near a busy road, this would be advised as they are not very road-savvy). Snowshoes have a lot of energy so they do need to have a vast array of toys at their disposal to keep them entertained.